Welcome back Greyhawkers! It's theend of 2013 and we made it to page fourteen in the second chapter of our ongoing Castle Greyhawk graphic novel. Follow the link above to get additional story script by fantastical author Scott Casper. Alternatively you can view the page HERE, courtesy of Maldin's Greyhawk. Artist's Commentary: This episode had some nice artistic elements to it. The bottom four panels are fun because the view is unchanged and you get Robilar and Terik jostling around. Side thought, I wonder which one of them is oldest? The upper panels I'm quite satisfied with as well. There is a lot of natural cloth draping going on in Tenser's robes (which I've had plenty of practice on by now) and Robilar's cloak. There is also a couple really good profile drawings there, which if you've ever tried to do, is not an easy feat at all. Last tidbit detail if anyone cares. Every time I draw the squiggly runes on Tenser's sleeves and bracer I am reminded of my old Greyhawk comic where I did the same generic glyphs on Boccob's robes. And every panel they changed. With the god of magic I always imagined that the runes were literally morphing from panel to panel. The same isn't true for Tenser necessarily, but it's just a time saver to make up new runes on his clothes each page. Time to update some developments in one of my spin-off Sea Princes Campaigns. 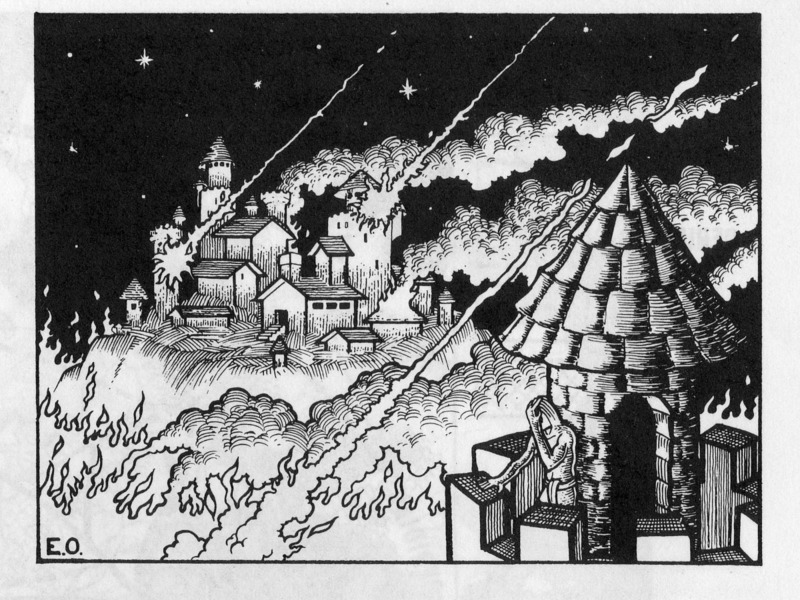 After having exploited the Mines of Hokar, the players consulted with everyone they could (including the Seekers) on a new location to find adventure. In the end, party member Ivy Nightfall chose a place she heard vaguely about from her elven childhood; the Lost City of the Suel in the Suss Forest. A sage was hired, ships chartered and supplies were gathered and they sailed forth from Monmurg to Gryrax, capital of the Principality of Ulek. Leaving their sage behind in the town of Thrunch, they hiked north to Ivy's secluded homeland of Celene with the plan to search by water, beginning from the Handmaiden River and then following the current south down the Jewel River. Much to my player's surprise (not really), my set up for this new adventure is an old school hex crawl much in the same fashion as my dungeon crawl in the Mines of Hokar. I created a map of the Suss-Pomarj-Wild Coast region for the players to view and track their search through the tangled wilds. I'm using my favorite hex within hex paper. 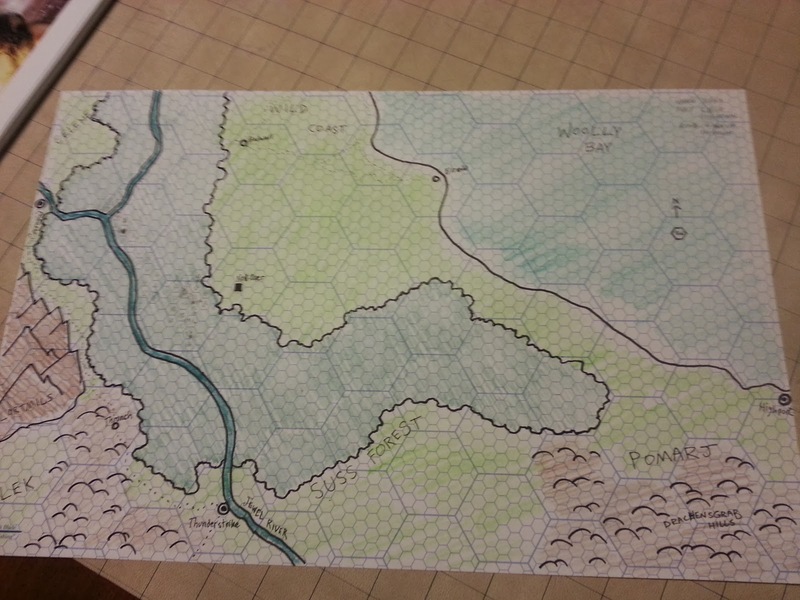 The large hexes is a standard Greyhawk 30 miles across while the smaller hexes are 5 miles each. As the Suss is thick and hazardous to move through on land, each 5 mile hex constitutes 1/3 day's travel/searching while travel by water is more rapid for example. The Strange Flora Chart is a fun list of herbs, flowers and such that I've culled from many game sources over the years. Those with enough knowledge of nature can find these rare bits of plant life, each with a game application from healing properties to poisonous effects. Natural Hazards is a short list of obstacles to overcome like quicksand, brambles or disease carrying insects. Trails can lead to wandering monsters but also can potentially lead players astray. Needless to say, a ranger or druid is invaluable for their skills here. The Keyed Locations are special points of interest that, taken as a whole, paint a picture of the ancient story the characters are trying to discover in the heart of this forest. To demonstrate, the players so far have found a cavern of latent evil (think Dagobah here), named elven arms/armor lost within the thickest bramble patches and most recently a stone marker that can potentially be a clue to the location of the Lost City itself. The Lost City campaign is a true grind, yet the Suss is not an overly large region, so searching it shouldn't be too daunting time-wise. Scale this system up to a truly vast area like the Burneal Forest, Amedio Jungle or the Corusk Mountains and you could have a long term campaign indeed! Ah yes, it's the time of the year when I look back on Needfest comics. One of these years I really should write something new like a Needfest Carol, or the Nightmare Before Needfest, or perhaps an action comic like, Die Vecna Die Hard! Well until the right inspiration hits me I'll have to replay the Greyhawk classics like they do on TV every year. My favorite of course is a Needfest Story. The true untold story of those secret times. Another labor of Needfest love is How the Gruumsh Stole Needfest. Read this and you'll never look at orcs and elves the same way. Lastly, I recommend my first Needfest Musical Extravaganza. Parodying music lyrics is quite a challenge, but with Lydia's help I got through it three years in a row! Enjoy and Merry Needfest, Greyhawkers! 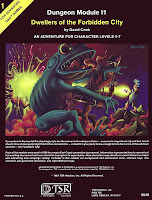 Well most have heard about the official release of D&DNext by now so I won't cover that. Speculation is also beginning to swirl about the fate of Dragon and Dungeon Magazines, currently finishing it's run on 4e content. All the while there is an actual print magazine out there that's picking up momentum albeit in a quarterly fashion. First off, the cover is by the illustrious Clyde Caldwell whose works can be found in countless RPG products and of course classic Dragon mags. 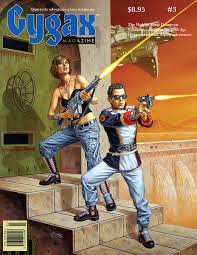 For this cover illustration he brings us a pulpy sci-fi scene with flying ships and laser guns. What's not to love? The Airlancer by Jayson Elliot is a new fighter-type class for AD&D. Like the name implies, this is a class that is tailored for riding flying mounts, specifically hippogriffs and griffons. Like you'd expect from AD&D there is many charts to go along with the class including Level titles and a handy guide on how quickly airlancers can overcome the effects of intoxication. Great stuff. Artifacts to Impart Ancient Lore by Michael Curtis is another clever article. This piece introduces a series of magical "repositories" which contain vital knowledge that once activated, can be useful to an adventurer. Mr. Curtis manages to adapt all these items to rules for 1st, 2nd, 3.5/Pathfinder and Basic D&D rules. Impressive. They All Died at the International Space Station is a new Metamorphosis Alpha adventure by the renowned James M. Ward. Set in the year 2031 this is a prequel of sorts for the futuristic spacefaring RPG. The introduction covers some interesting history about the ISS that leads up to the player's mission onto this orbiting station. This module has everything you'd want in a sci-fi thriller. The Marmoreal Tomb of Garn Pat-Uul is an amazingly classic dungeon crawl by Ernest Gary Gygax Jr. and Benoist Poire. It is a 1st edition compatible module for levels 1-3. The players are there to search the remains of a dwarven mining expedition that met an untimely end once they uncovered the tomb of an ancient giant lord. This adventure has a gorgeous full-color fold out map and the interior art is by one of my favorite illustrators of all time, Jim Holloway. Excellent work! That's all for now. Check it out. I can't wait to see what Gygax Magazine has in store for next season. New, over at Dragonsfoot, is a marvelous set of downloads by classic AD&D author Len Lakofka. 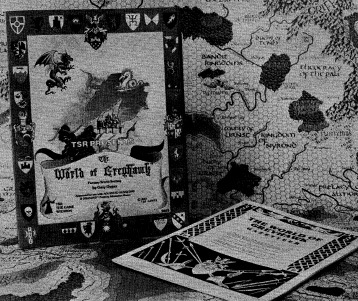 Set in the World of Greyhawk, the Kroten Campaign is another part of Len's famous Lendore Isles series of publications. This is the Kroten Campaign Guide for the L5 module, providing information on the town of Kroten and the surrounding area. This is the Kroten Adventures manual for the L5 module, providing five adventures in an around the town of Kroten on the Lendore Isles. This is the Kroten Campaign Companion for the L5 module, providing new rules, weapons, armour, gods, clerical abilities, magic items, spells and monsters. This is the Kroten Map Pack for the L5 module, containing the maps required for use with the L5 series of books. Already familiar with the Lendore Isles, or looking for a localized campaign to start? Well, DMs, have a look at the Kroten Campaign, Len and the fine folks at Dragonsfoot know how to make good old school publications. Welcome back! 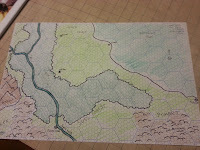 Today in honor of the second movie release of my favorite story, the Hobbit (Desolation of Smaug) I have an interesting discussion that ties into my current Greyhawk campaign, a hex crawl in Suss Forest. If there is any spoilers I apologize, but come on, it's the Hobbit! But first, speaking of hex crawls, there is an awesome article over at Wizards by James Wyatt on that subject. 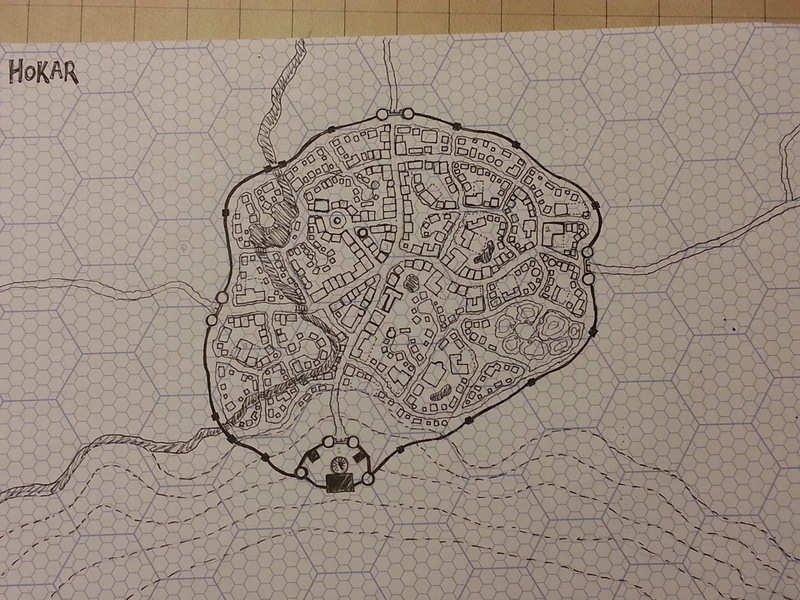 He goes into great detail on comparing hex scales to maps both fantasy and real world. It's rather interesting, take a look. Added to this topic, over at Greyhawk Grognard, there is a wonderful post on finding viable hex crawl adventure locations in the Flanaess just like the sort I'm currently running in the Suss. This post is a must read. A dark, evil wood that is dangerous to pass through, inhabited by monsters (like Spiders), difficult to pass but on the fringes it is still worked by civilized races. For instance, you got humans in the Wild Coast (later humanoid ruled), and orcs/goblins in the Pomarj, then you have the obligatory elves in Celene (a very Rivendell-ish area). Mirkwood of course is outrageously bigger, more akin to the Vesve Forest, but I'm going for feel here. Here's the fun part, what the Suss has that Vesve doesn't is the Jewel River. Much like in the Hobbit, you can literally run into wood elves in the bordering Welkwood, (or Celene for that matter) escape in barrels and float down the river through the Suss to the Principality of Ulek where humans and dwarves work together in harmony much like the middle-earth lands of Dale and the Lonely Mountain. Not surprisingly, on the other side of the Misty, er Lortmil Mountains you got the County of Ulek home to many a halfling, or not much further away to the north beyond Greyhawk City (human buffer) you can find an adventurous burglar in the town of Elmshire. Really the only thing this setting is lacking is a cool dragon like Smaug. I mean one sitting on the treasure of an entire dwarven kingdom. Perhaps in the mountainous Pomarj to the east, which is rich in gems and was once home to dwarves? Yes, that could work nicely. I could probably go on, but you get the idea. The similarities between the Flanaess and Tolkien's world should be obvious to experienced gamers or readers, but don't dismiss it, no this is an advantage in my opinion. When you take these iconic locations and relationships, then couple them with the visuals of a lavish movie, it only aids in players' immersion in the setting. That should be what all DMs strive for when they run a fantasy game. Welcome back Greyhawkians! We're rolling on to page thirteen in the second chapter of our ongoing Castle Greyhawk graphic novel. Follow the link above to get essential between page dialogue from sagely author Scott Casper. Alternatively you can view the page HERE, courtesy of Maldin's Greyhawk. Artist's Commentary: This page gave me some trouble I must admit. I don't often do this but I started drawing the page in reverse panel order and it tripped me up somehow. Most likely due to perspectives and character composition. Once I got past this the whole thing came to together nicely. Tenser and Terik are a fun duo by the way. I do miss Ehlissa, but there is something about Terik I like and we barely know much about him up to this point. Robilar of course has been on a mission since the beginning of chapter two. I can't wait to see what his next move is going to be. It's been a rough week. The Black Rider is trying to keep me down, but new posts will be arriving soon. Just for my own recollection I have a new Castle Greyhawk comic page to comment on, I have campaign news from the Suss Forest and maybe a review of the newest Gygax Magazine I got in the mail. Anna Meyer's grand Flanaess map quest is still in its final stages. Her monster wall map is a huge download but may well be worth it to lovers of Greyhawk and fantasy cartography in general. Check that out and more on Anna's own regularly updated blog. Time for a random Greyhawk topic. One of the quirky things about the Greyhawk setting is the seemingly useless esoteric details Gygax inserted here and there. One of the better known bits is that the religion of Pholtus (God of Law, Sun, Moon, etc.) has an official "anthem" titled O Blinding Light. Now never mind that this may be the only song in all of Greyhawk canon; it's more impressive that this obscure title by Gygax inspired someone in the fan community long ago, to come up with the lyrics to this anthem. If anyone remembers who wrote this let me know so I can properly credit them, cause this takes dedication (which Pholtus demands). Next time you play a cleric of Pholtus, show off to your DM and break out this hymn. Check it out. Aid us it will to conquer the Heretics. Give us the Light of the Day, as we praise you at Dawn. Give us the Light of the Night, as we praise you at Dusk. I reveal your Light to the Converts. Protect us, your faithful servants. O Blinding Light of Pholtus. Light, The Divine Substance From The Creator. 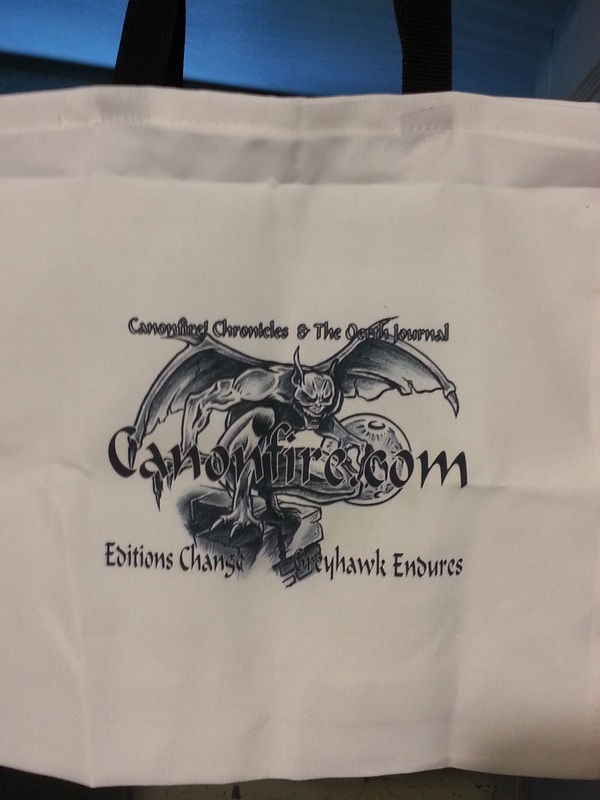 Welcome back fans of Greyhawk! We're cruising along up to page twelve in the second chapter of our ongoing Castle Greyhawk graphic novel. Follow the link above to get all important lead-in dialogue from Scott Casper. Alternatively you can view the page HERE, courtesy of Maldin's Greyhawk. Artist's Commentary: This page flowed quite well as a result I'm very happy with the direction of things. The composition of characters with text worked out brilliantly too. I always try my best to give Scott exactly what he asks for in his scripts. Many times I don't know how the word balloons will fit on the page until I start sketching and even then it's a challenge. For this reason I have to draw everything on the panel just in case, knowing full well details like belts or sleeves will get covered up. There's tricks to avoid this but a little overlap doesn't hurt. Anyhow, I love this page's composition, the mannerisms and expressions. All of it. Enjoy! In my current Sunday Hold of Sea Princes game there is a long-running quest object/s called the Golden Toli Captains. These are merely oversized (and overpriced) gold coins with no magical properties except a certain compulsion on the local ruler of Hokar. I've often mentioned these coins in my campaign posts. At long last, here is some backstory on the 33 Golden Toli Captains. For many decades the accepted gold coinage in the Hold of the Sea Princes has been the gold Admirals minted out of the capital of Monmurg. Twenty years ago in Port Toli however, the rulers of House Toli wanted to defy the economic conditions in the Hold and tried to start their own currency. The first of the series, the gold "Toli Captain" was indeed a work of art and was designed to be larger than most gold coins, befitting the arrogance of Port Toli. The coins were to be minted in the mining town of Hokar, but early into development the plan was ended by the Prince of Monmurg as House Toli relented. The plates for the infamous Toli gold pieces were destroyed but the Marquis of Hokar, Symeon III a metal-smith and enchanter of note, had managed to strike 33 of these coins before this happened and he locked them away in his dungeon vaults to be used at a later time for his own purposes. Only he and his son knew what ulterior plans they had for the coins. Symeon III died before his dream was realized and his lazy son never followed up on the plans of his father. Only after "the incident" in the Mines of Hokar did Symeon IV fear for his life and start a search for the invaluable Toli Captains. The 33 coins are all "master work" quality items worth much more than their weight in gold, possibly 200-400 g.p. apiece to a collector (the Marquis has offered anywhere from 500-1000 g.p. for each). One side bears the likeness of a typical Port Toli captain while the other side is imprinted with a Sea Princes vessel. Due to their being lost in the cavernous Mines of Hokar, they are not pristine and most should be scratched and dirtied. Notes for the DM: The golden Toli Captains are rumored to be magical or perhaps hold a resonating effect if they all gathered together. The ruler of Hokar's obsession over them and the fact they were minted by a mage is hard to dispute. Besides their ridiculously treasured value, the 33 coins are unfortunately just plain gold. The true motives of the Marquis (his father's dream) is to use the combined masterwork coins as a special tribute to the enigmatic pirate group known as the Fivefold Council in a bid to gain their unrivalled personal protection; the fabled Ward. Though there is no guarantee the Council will be pleased with this gift, the chance to impress them with a thematic work of art such as the Toli Captains is worth the time, money and effort (and deaths of PCs) for the slovenly Symeon IV who lacks the adventuring spirit of his forebears. First up is Jallarzi Sallavarian. Nothing new here except this is a sweet illustration of her that I hadn't seen till recently. She kind of has that big 80's hair-smugness about her. Well, she is nobility after all. Now compared to her illustration in From the Ashes, I think I prefer the sleek, curly-coifed Jallarzi with the arm length gloves. Tastes may vary I guess. For completeness, here is the back of Jallarzi's card. This card as you can see was part of a set showing all the Circle of Eight as of the timeline events in Rary the Traitor. Who is this wizard named Pax? My guess is he was erased from existence for being audaciously arrogant enough to mess with the perfection of Mordenkainen's magic. Either that or he was kicked to the curb when Mordy found a comelier student in Rautheene from the Wizards Three articles. A Neutral Evil gnome? Shock! Willara also sports Gauntlets of Ogre Power! Not bad. Apparently she got them from this devious Thartis fellow who works for Ivid the Undying (who sits the Malachite Throne). Overall a fun entry; my favorite part being the end, where Willara hopes to be a name to remember. Fail. That's it for now. Plenty more cards to muse over another time. Welcome back loyal readers! We're already up to page eleven in the second chapter of our ongoing Castle Greyhawk graphic novel. Follow the link above to get extra exposition from the mind of Scott Casper. 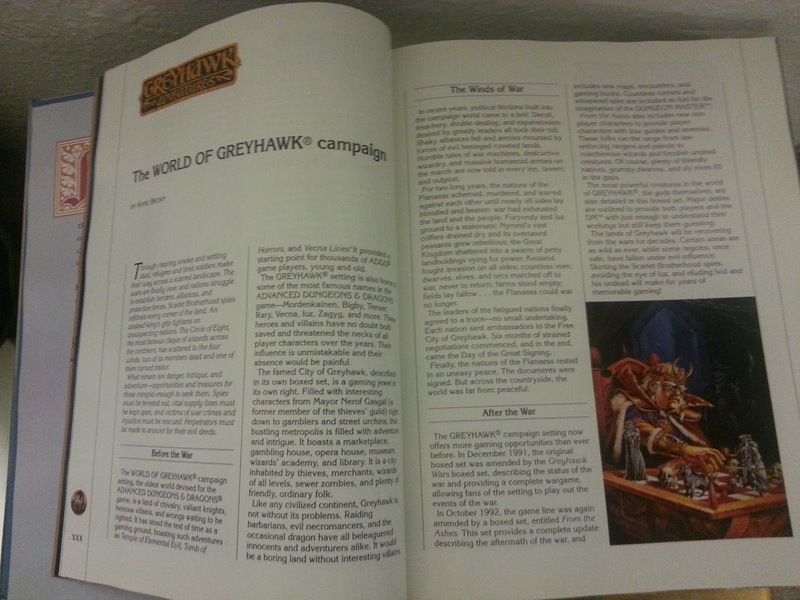 Alternatively you can view the page HERE, courtesy of Maldin's Greyhawk. Artist's Commentary: The scene has shifted to Captain Drake and his bandits as well as a mysterious new character. 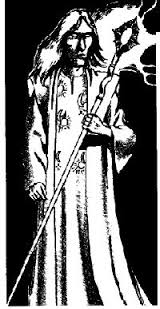 This wizard and his ominous master should prove to be a long term threat for the heroes of Castle Greyhawk. I dig drawing Drake, but his bandit group is refreshing as well because they are not uniform in appearance. One recurring bandit looks like a chubby alcoholic pirate while others look like serious professional soldiers. With such a mixed band of characters I'm anxious to see where these aimless villains go next. Not a Greyhawk post I know, but Thor: the Dark World is finally upon us! Those who know me know that I'm a big Thor comic book fan (not to mention Loki), but few probably know my second favorite Thor villain is Malekith the Accursed, the dark elf antagonist of this new movie. I've been keeping myself in media silence for a long time and I'm sure the wait will be worth it. Speaking of Marvel movies, I also just read this news item about Marvel doing a series of 4 made-for-Netflix shows using B-list heroes such as Daredevil and Luke Cage that will culminate into a Defenders team up show ala the Avengers movie set. Sounds exciting. first Agents of Shield, now this. DC comics take notice! "The Enfrahl are surreal horrors created through the whimsy and caprice of the Lord of the Undead---a cross between ossified guardians, bone sculptures as performance art, and sentient, demonic knick-knacks, the enfrahl represent all that is twisted and grotesque in the imaginings of Orcus and his ilk. That they are intelligent and aware is all the more damning….” --- Iscladoc the Dark, from his _Commentaries on The Demonomicon_." Anyone looking to explore more about the Prince of the Undead and his minions will find grodog's insights useful for their campaign. Enjoy! Over at ENWorld forums there is a series of collector guides for D&D and its various settings. This may not be anything new to some since I think they've had collectors guides there for a long time, but having recently come across it this week I thought I'd share the info anyways. 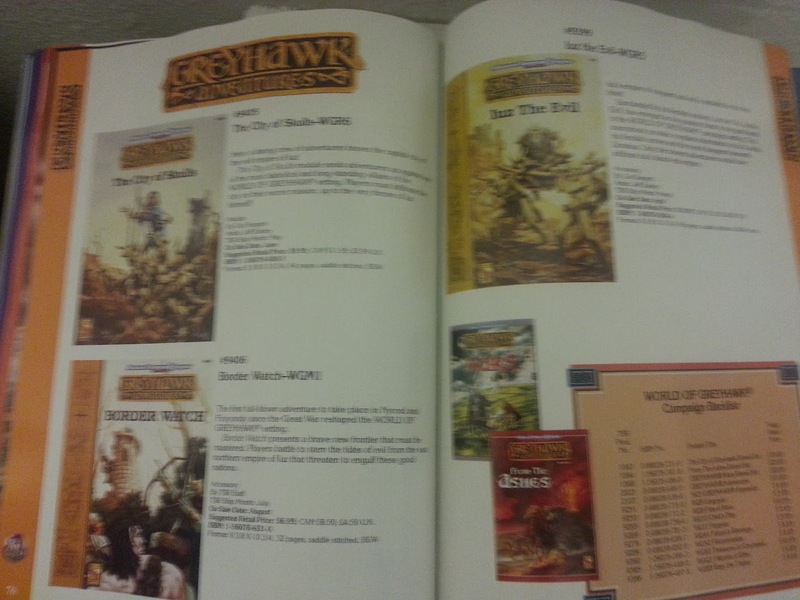 That said, I don't think I've seen a better, more comprehensive list for the World of Greyhawk. It has everything you could want from module dates to magazine article numbers, even Greyhawk clothing, promotional items and minifigs from antiquity! Page two then takes it to another level and lists the insane multitude of Living Greyhawk module titles. Kudos to Echohawk for maintaining this guide and those who assisted in his efforts. I'm a bit slow on the gun with this Greyhawk tidbit, but the fellas at Canonfire! have been murmuring about a listing of D&DNext compatible adventures at Wizards, one in particular will be showing in Dungeon's December issue, titled the Battle of Emridy Meadows. This may very well be the last issue of Dungeon as well before their hiatus. This "Battle" adventure must tie into the Temple of Elemental Evil overview published in issue #425 of Dragon. Oddly I previewed the blurbs for Dragon #425 (subscription only), but didn't later review it I think (Gencon hangover?). Anyhow, the Temple article in #425 had a good amount of Greyhawk content, nothing left out that was critical. 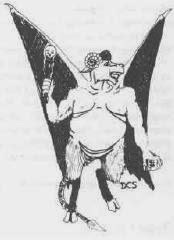 It even incorporated canon from the later Return to the Temple of Elemental Evil module from 2nd edition. Author, Skip Williams certainly did his homework trust me; the article mentions Veluna, Furyondy, Kron Hills, etc. Back to the Battle of Emridy Meadows. I am intrigued to see what comes of this. Will it be a historical battle reenactment? I highly doubt it, mass combat wouldn't translate easy in playtest material. Perhaps the battle will be a backdrop to a PC-led sortie behind the lines. Or maybe it's a return to the scene of the battle years later to fight some lingering effects still there, or originating from Zuggtmoy's lair. So many questions, and it should excite any Greyhawk fan. Lastly, if you aren't familiar with the battle somehow, here, I wrote an article about it at Canonfire. Time for some show and tell from my current Greyhawk campaign, The Mines of Hokar. I've set this simple dungeon in the Sea Princes town of Hokar for three reasons. One, it's largely undetailed in canon (at least pre-Wars); second it's a crossroads between the western half of the Hold and their eastern ports making the town a great launching point. Third, it has an interesting location next to hills which is perfect for the backdrop I needed for this generic dungeon crawl I created. What happened over time however, like in most sandbox games, the town itself began to be explored between dungeon jaunts. Now 5th level I've belatedly drawn a map of Hokar for their amusement and hopefully good use. There's a few shops and places I've keyed so far, mostly potion makers and sages (it's been a good year for them). There are three roads leading out of the town; west goes to the Duchy of Berghof seen in the modules The Gauntlet and The Sentinel. East goes to where the road forks to Port Toli or Monmurg. And the north road, well that leads to Westkeep by the swamp. The southern keep is the abode of Marquis Symeon IV whose mines and treasure vaults have been overrun by monsters. Down below he sends dungeoneers on searches for his lost collection of rare Toli Captain coins; currently only one away from completing the set. More on those coins to come. Until then enjoy the map and perhaps someone else's campaign can add to Hokar as well. As reported last month, the newest issue, Dragon #427 features among its lineup an article on the god of death in Channel Divinity: Nerull. The bad news for Greyhawk fans is this capable article by Jon Green covers the 4th Edition pantheon version of Nerull rather than the classic deity of Greyhawk lore. For those who still want to download and read this article you will need a D&DI subscription. Before I continue on with an overview of the article, the foreword to this issue, Going Dark by Chris Perkins indicates that the Dragon and Dungeon ezines will both be put on hiatus at the end of 2013 and will come back sometime after D&DNext is released. They are not taking any more pitches for future articles until then and Perkins suggests that writers bone up on the new edition rules in the meantime. In this alternate version of Nerull, he is the one of the first human wizards to learn magic from the deity Corellon. He soon joins the gods in the prehistorical Dawn War against the Primordials. Things are going poorly for their side so he develops necromancy to keep mortals in the fight. The actual god of death Aurom isn't impressed though. Death is part of a natural cycle he tells Nerull. None of the other gods would side with Nerull either, but the fight against the elementals continued nonetheless. Except this time Nerull turned on Aurom during the next battle and inexplicably killed the god! Having done this, Nerull stole all of Aurom's divine power and portfolios. The other gods relented to this and the war for control of the world continued. Nerull's ambition and power grew and soon other deities like Pelor, Moradin and Corellon, secretly began plotting behind his back despite the death god's effectiveness in the Dawn War. Eventually one of Corellon's other wizard students died in the war and her soul passed to Nerull's realm of Pluton. This soul was doctored by the gods of good to bait Nerull. Nerull took interest in this soul which was named Nera. Infatuated with Nera, Nerull gave her more power, but Nera instead learned his secrets and used them to overthrow Nerull thus becoming the goddess of death. Her name is now the Raven Queen. This background is surely not new to any one who has followed 4e, I myself have lampooned the Raven Queen in my former Greyhawk webcomic, but it's the first time I paid this close attention to Nerull's mortal origins. In a Greyhawk cosmological context it is not out of bounds to say Nerull (or Pelor and Corellon) a greater deity, has influence on multiple planes of existence. We know Mayaheine for instance is a demigod follower of Pelor from another world. Aurom, the Raven Queen and Nerull studying under Corellon doesn't do much for Nerull in Greyhawk I admit, but if one put their mind to it the information in the article could be put to good use. For instance the article continues with some good sections on power groups associated with the rise (or fall) of Nerull; The Legion of the Gray, the Star Reapers, and the Triumvirate (with ties to Vecna) are all quite interesting in their own right and could work in any campaign. The article finishes with powers and feats for Nerullite characters and some good background on what Nerull's sentient scythe Lifecutter is up to. That's an epic artifact you could tempt a party with! Good stuff overall if you can look past the absence of Greyhawk canon. Welcome back Castle Greyhawk fans! I'm ahead this week and since it's my birthday today I'm going to let everyone know they should read page seven in the second chapter of our ongoing Castle Greyhawk graphic novel. Follow the link above to read some plot driving script by the daring Scott Casper. Alternatively you can view the first page HERE, courtesy of Maldin's Greyhawk. Artist's Commentary: This page took me a while to get going but once I had some sketches going it turned out great. The first couple action panels are among my favorites since doing the Castle Greyhawk story. The parry and punch has such a cinematic feel to me. The longer I draw a character the more effortless it is for me and they become more expressive. What more can I say? Well, next episode: Gronan vs. Robilar is going to be epic. Welcome Greyhawkers! A week has passed so it's time to remind everyone to read page six in the second chapter of our ongoing Castle Greyhawk graphic novel. Follow the link above to read some integral story exposition by author Scott Casper. Alternatively you can view the first page HERE, courtesy of Maldin's Greyhawk. Artist's Commentary: Huzzah! The return of Tenser. Oh how I miss drawing his helm. Hah, right! At any rate this episode marks the debut of a new character to the story. Those who pass their Gygax ancient history checks will know who this Terik fellow is that Tenser has allied with, until then you'll have to see what the trio has planned next issue. Stay tuned. A week ago over at ENWorld, head honcho Morrus posted this thread in the forums concerning an article at AICN which talked to D&D head honcho Mike Mearls about various things including setting support. Ready, readers? Speculation away! "A rumor has been going around that WotC is approaching the various creators of their most iconic game worlds to bring them back in some capacity as the worlds are re-created or re-imagined for the next edition of D&D. Ed Greenwood’s firmly on board, as he’s writing a monthly column on Forgotten Realms. In a Q&A on the #RPGnet IRC chatroom, Margaret Weis has stated she would be willing to work with Wizards of the Coast again (Kender are a subrace of Halfling that only exist in the Dragonlance world), while Keith Baker (creator of Eberron) has stated that he has been in talks with WotC but “they haven't decided what form setting support is going to take yet”. " So far only three mentioned in the rumor. Three with definite authors still associated with them. We know FR is in, and the latest D&DNext playtest includes Kender and Warforged. Easy enough. Reading on through the thread some comments are worth discussing. Delericho says: "Sorry, I can't see it happening. WotC know the folly of trying to support too many settings; that's how they came to own D&D in the first place. They also know that their success with any non-FR setting in 4e was... limited. Unless they're now willing to go down the route of licensing out settings again, I really can't see any non-FR setting getting any support outside of the e-magazines." I agree with his assessment commercially, though concerning Greyhawk, it DID enjoy years of success through the Living Campaigns and in the pages of both magazines as he states. The assumption most would agree on I'm guessing is that based on Paizo's success a lot of those fans moved on with the writers and old rules-set and are now entrenched in Golarian. Re-releasing something like Greyhawk won't take away from FR's fanbase, it would be to lure people back from Paizo. Timothy Brown today announced that he intends to create a whole new role-playing game world titled Dragon Kings, the ‘spiritual successor’ to his popular design Dark Sun. This new world will be envisioned not only in fiction and art, but in music, as well. 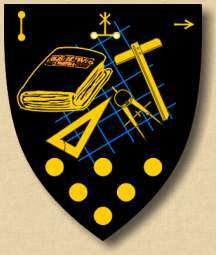 The comments go on, largely supporting Greyhawk. It is also mentioned a couple times in the thread that Mike Mearls is a big fan of Greyhawk. Color me surprised if this is true. Much of the Greyhawk love on the e-magazines has been coming from Chris Perkins. Either way they have to be saving Greyhawk and these other settings for a special occasion. Now seems like the perfect time. "And that's the important thing: Paying respect. A LOT of players who jumped ship during 4e era did so because they felt the game had moved too far from what they felt D&D was, and that WotC wasn't paying respect to the material. Do they need to go to Ed Greenwood or Keith Baker? No. They own the IP, straight up. They can do whatever they want with it. Same for Dragonlance, Ravenloft, Dark Sun, and every other campaign setting outside the stuff like Star Wars or Wheel of Time that they licensed back in the 3rd Ed era. What they're doing by bringing back the original creators to work on these settings - even if it's just in a consultation role - is getting validation for the new system. "You didn't like what we did in 4e? I'm sorry, we learned our lesson. Ed Greenwood himself is writing the new novel to fix it. We're also doing this huge open playtest to make sure we get the core system much closer to D&D's original roots. And we're starting to sell all our old back catalog you used to have to spend a lot of time searching for then paying outrageous collectible prices to get. We cool now?" My gut feeling is that we're going to see Forgotten Realms be the "Default" setting. They'll then release "Themed books", where each book is tied to a genre or campaign style rather than a specific world. Rather than getting a Ravenloft setting book, you get a Horror-themed book with all the rules, class builds, monsters, etc. you'd need to run a horror-themed campaign. Then you'd get a pirate one for sea-based adventures, an urban one, a magitek one, a desert one, a political one, etc. This gives you all the rules you need without branding the rules to a specific setting, avoiding the pitfall of branding issues. Then they'll release campaign books that are rules-free (similar to the Elminster's Forgotten Realms and Menzoberranzan books from last year) with guides for what additional rulebooks you'd need for each setting. So rather than cramming a bunch of rules in the Ravenloft book, it instead just talks about each of the different demiplanes. This opens up page count to more narrative-based setting books, which allows cross-platform sales so people who play Pathfinder or an OSR system can still purchase the campaign setting and use it in their system of choice. Want the specific D&D Next stats for Strahd? Check out Dragon Magazine #whatever (and expect those to switch from a subscription-only model to also allow purchase through the online store of individual issues). I've got absolutely no solid evidence this is what they're going to do other than my gut feeling and extrapolating from the various interviews and Q&As going on. I don't even think WotC knows how they're going to do it yet since they're still focused on the rules right now. Branding and release schedules will probably get nailed down toward the end of the year or beginning of next year." 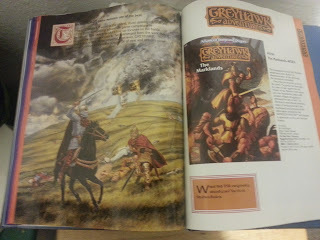 I still have high hopes of a Greyhawk resurgence, if only Wizards would put a fraction of the effort into Greyhawk that they put into serializing and promoting FR. Remember, even with so many other D&D outlets now, Greyhawk fans haven't gone away, we're just waiting patiently for Wizards to take our money. Summer is winding down at last, but panning for nuggets of Greyhawk news is still yielding results. This week I have a few items of various interest to the community. 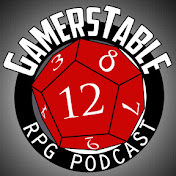 Over at our gaming podcast, Gamerstable we discuss creating characters and NPCs as a group. The episode is sponsored by Chamber Band a music group that has released a new D&D themed album called Deities. There are songs such as Yeenoghu and Lawful Neutral that should pique your interest. Be sure to check out their work! My good friend and all around creative guy, Argon from Canonfire! 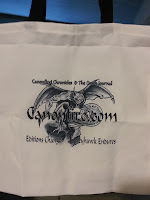 is already trying to get me geared up for next GenCon with this Canonfire shirt and Canonfire Chronicles tote bag. I certainly have my work cut out for me! "Compared to most dead gods, Nerull still has a surprisingly large following, though those followers are still rarely encountered. Worship of the dead god typically involves leading a double life, as public adulation of Nerull would likely lead to death or exile." I can't wait to see where Mr. Green goes with this article. Nerull hasn't been mentioned in a D&D publication in some time I wager. The closer to D&DNext we come, the more Greyhawk starts to leak back into the public eye. Hang on for more on Nerull. Howdy Greymavens. It's a light news week for me so I thought I might spotlight a couple articles currently on the front page of Greyhawk fan site, Canonfire! "East from Hepmonaland lie the islands of a powerful Touv civilization called the Kingdom of Qinlo. Magic, mystery, gladiators, sea monsters, jungle druids, doppelgangers... This and much more awaits for you in this African-themed lost world." Check out this article if you're looking for an exotic tropical land to send your characters. 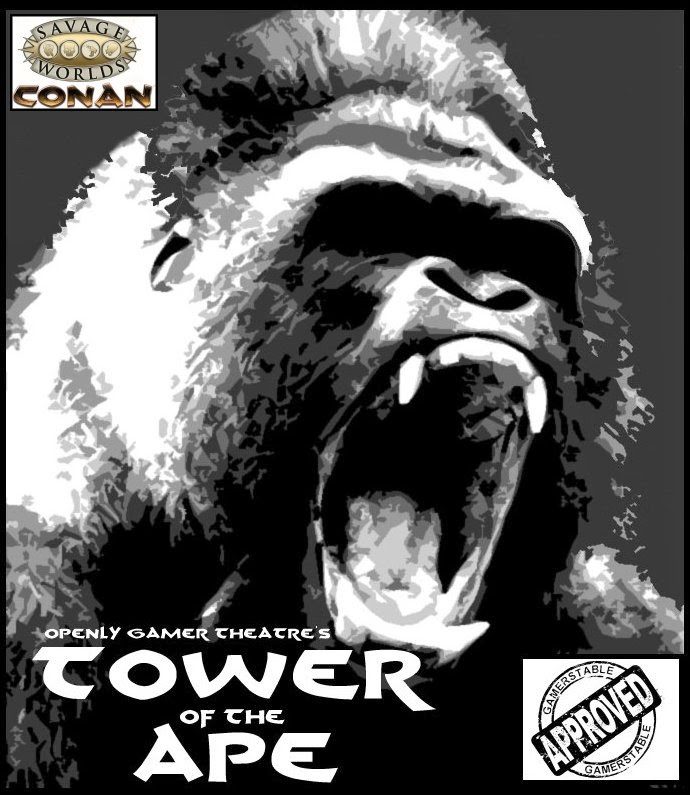 Next up is a new map by frequent contributor Wolfsire. His Rockburg-on-the-Marsh map details a location in the southwest of Greyhawk seen in the obscure module Gargoyle. 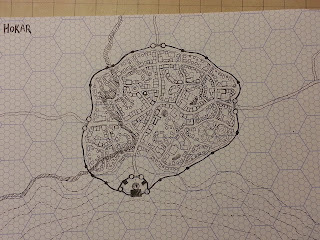 Check out and download this town for use with Gargoyle or any campaign location if need be. Last but not least is the triumphant return of long time author, Grodog to the front page of Canonfire! His Excerpts of the Demonomicon of Iggwilv series are among the most read features on the site. This time around Grodog brings to us some demonic lore, appropriately about Gresil, the Demon Lord of Demonic Lore. This diabolical article also includes stats on Gresil's librarian servants, the Stagrynax. Be sure to check out this addition to the outer planar pantheon of evil. Be warned: Grodog has more in store. Well met Greyhawkers! It's high time I remind everyone to check out page five in the second chapter of our ongoing Castle Greyhawk graphic novel. Follow the link above to read some important literary extras by author Scott Casper. Alternatively you can view the first page HERE, courtesy of Maldin's Greyhawk. Artist's Commentary: This page took a bit longer to get out than I expected due to Gencon, but it was well worth it. I drew the first panel twice from two distances and the fifth and sixth panels took multiple tries. Sometimes it's hard to get the perfect angle or expression. Practice makes perfect though. If you're wondering about the guy following Robilar and haven't read all the exposition yet, yes he is an homage to Conan so you know that's gonna mean trouble. Anna Meyer has been working feverishly toward the end goal of her massive World of Greyhawk atlas. With the Dry Steppes nearly behind her she now has posted previews of my beloved land of Ull and Ekbir! It's been a personal joy to see Anna map Ull not once but twice. The first time was for my Oerth Journal #19 gazetteer back in 2006. Now Anna can see the finish line of her cartographic marathon run. This newest preview map shows that she has rendered almost the entirety of the Flanaess at last. All that is left is minor tweaks and revisions, easy stuff for her. I applaud Anna's tireless efforts over the years and I look forward to seeing what more Greyhawk she has in store. Crosslinked from the Canonfire Crier blog, here is a summary of some items from Gencon 2013 that may be of interest to the Greyhawk community. Enjoy! Howdy folks. It's the day before Gencon and I have nothing new yet to report, so let's get nostalgic instead. A couple weeks ago a friend of mine found this gem and didn't want it. 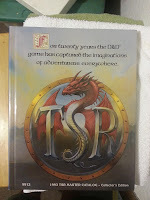 It's a near mint copy of the "Collector's Edition" of the 1993 TSR product catalog. This book is quite amazing. 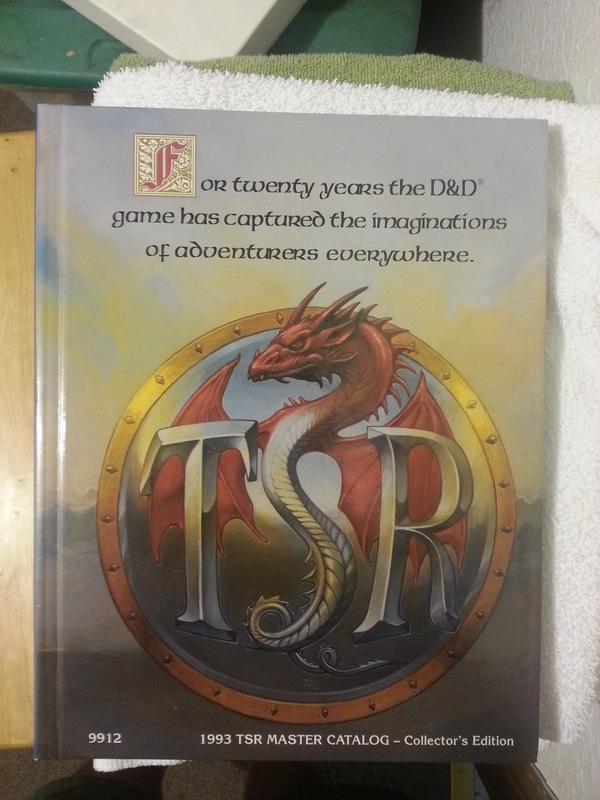 Not only is it a hardback, glossy paged catalog (wow), it's from the heyday of D&D during second edition when TSR was pumping out so many games and product lines it will make your head spin. For example, Forgotten Realms, Greyhawk and Dragonlance are at their height of course, but here we also have Al Qadim (this was the year it got official stuck to Faerun), Dark Sun, Ravenloft and Spelljammer still going strong. There was also the regular Dungeons & Dragons line that had your Mystara products such as Champions of Mystara boxed set (building off the famous "Princess Ark" Dragon Mag articles). Not only was 1993 good for those D&D mainstays, TSR was showing off new material for the Buck Rogers High Adventure RPG, Gamma World and many board games like Dragon Quest. 93 saw the release of some notable books, supplements and adventures for D&D like the Book of Artifacts, City of Lankhmar, the Complete Gnome and Halfling Handbook and Dragon Mountain (wink). 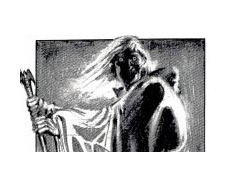 WGR4 The Marklands: "The foundations of the Greyhawk world have been shaken by disastrous wars. In the aftermath, the adventure intensifies! Once the pre-eminent power of the north, Furyondy has been bled by years of war against the evil empire of Iuz. Borders once secure are now wastelands, dotted with isolated villages, struggling to withstand the tide of evil. The Marklands sourcebook combines years of background with new excitement and presents all the information needed for the Dungeon Master and players to adventure on this war-stricken frontier." WGR5 Iuz the Evil: "Iuz's empire of conquest and evil is detailed for the first time! Surrounded by his fiendish minions, Iuz the Old, Iuz the Evil, has emerged as the greatest threat to the good lands in the World of Greyhawk campaign setting. This sourcebook provides complete information on Iuz's lands, his fiendish armies and the horrid dungeons beneath Dorakaa. Only the bravest adventurers would dare infiltrate Iuz's blood-red empire." WGR6 The City of Skulls "Here, a daring crew of adventurers braves the capital city of the evil empire of Iuz! The City of Skulls module sends adventurers up against one of the most diabolical and long-standing villains of the World of Greyhawk setting. 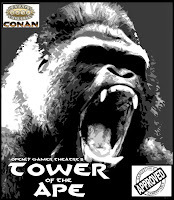 Players must infiltrate the city on their secret mission, up to the very throne of Iuz himself!" WGM1 Border Watch "The first full-blown adventure to take place in Nyrond and Furyondy since the Great War reshaped the World of Greyhawk setting. Border Watch presents a brave new frontier that must be mastered. Players battle to stem the tides of evil from the vast northern empire of Iuz that threaten to engulf these good nations." All in all this was a fun book to thumb through and read. Now I'm off to Gencon to find out what the future holds for D&D. Stay tuned! Hola Greyhawkers! Gencon is fast approaching, so I better get in a plug for page four of the second chapter of the Castle Greyhawk graphic novel. Follow the link above to read more exposition from our relentless author Scott Casper. Alternatively you can view the first page HERE, courtesy of Maldin's Greyhawk. Artist's Commentary: This page was quite fun to put together. Scott is populating the story with some cool characters and quirky homages. It goes without saying by now that the bandits are a mixed bag of styles in armor and armament. I can't wait to see how this plays out.